Every year thousands of dogs and cats are sent to the pound or given away because of a new baby’s arrival. Many parents worry about how they will interact with each other, and ultimately end up trying to find the pet a new home. In most cases this is unnecessary! With a little bit of planning and patience, baby and beast can learn to live side by side. In fact, many pets will soon become protectors of your new baby and they will end up being life long buddies as your child gets older. The key is to give them both time to get used to each other- and you need to pay special attention to your pet’s needs and fears. Here are some tips to make the transition easier. 1. Timing is important. 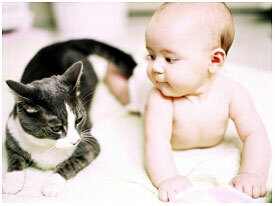 If you already have a pet, then you should have no trouble integrating the baby into your daily life. If you plan on getting a new pet after the baby arrives, think twice about it. It may be too much stress for the new pet to handle and they will be more likely to act out. 2. Go to the vet. Make sure that all vaccinations are up to date with all cats and dogs. They should be checked for internal parasites as well. It is important to plan ahead and stock up on preventatives, flea control products, heartworm medication etc. Once the baby comes you will likely be preoccupied and these routine medications may be easily overlooked. 3. Make surrounding changes early and slowly. Pets just like humans often fear change. If you are redecorating, do it slowly giving your pet time to get used to the changes. If they have a toy box, be careful not to move it as this will cause more anxiety. Many parents will move a comfy dog bed into the baby’s room, allowing their pet to explore the area and even nap in the room. Always have a separate bed away from the excitement; if you pet wants some baby-free time alone. Don’t scold the dog or puppy for going into the room as this will only cause resentment. Cats should be taught early on that the crib is not a place to sleep. 4. Buy a baby doll. A few months before the baby arrives, begin interacting with a baby doll (preferably one that cries.) This will get your pet accustomed to the crying and all of the attention. When your baby cries, cradle them with one hand and pet your dog or cat with the other. This will help calm them down. Place the baby in the crib or rock them in the nursery, so the dog begins to make the association. 5. Get them used to baby sights, sounds, and smells. If you have friends with children, ask to borrow them for a day. This will give you a glimpse at how your pet will act. Smells such as lotions, soaps, and baby powder are also helpful in the process. If possible, have someone come home with a baby blanket with the new babies smell. This will give your pet time to get used to the smell, before the wiggly crying source comes home. 6. Spend some time together. Once the baby comes home, try to include your pet in the festivities. Talk to them while you change diapers or nurse the baby. That way they will not feel ignored or left out. 7. Let them investigate. Pets explore the world with their noses, so let them smell the baby’s new toys and belongings. Stop them before they begin to chew or mark their territory, but let them explore a little. 8. Never leave the two of them alone together. Especially once your baby starts crawling and walking. The best thing you can do is supervise the situation whenever you can. If you must leave the room, crate the dog or take the baby. 9. If you suspect allergies, don’t automatically blame it on the dog or cat. Most allergies are food or soap related, so rule out all possibilities before you try getting rid of the pet. 10. Relax, your pet can sense your emotions and can tell when you are upset or nervous. If you feel confident that the two of them will get along, your pet will pick up on this and act accordingly.